The nature of what the digital revolution means is evolving as organisations adopt digital in more mature and fundamental ways. It started at the edge of the organisation, where the organisation touches its customers and has evolved ever deeper into the organisation to where it now enables completely new ways of creating and delivering value. Although this evolution is a continuum of change, I find it helpful to divide it into four distinct phases. The first phase allowed businesses to market and sell their (existing) products and services to more customers more easily over digital channels. It started with marketing, using informational websites, email and social media to reach customers, and gradually grew to include selling, and eventually servicing. During this first wave of e-commerce, often referred to as Web 1.0, a myriad of startups flooded the market selling everything from books to pet food, whilst established pre-e-commerce business struggled to keep up. The inevitable bust which followed the boom left a much smaller number of massive winners (think Amazon.com), a much larger number of failures (think Pets.com) and that almost no businesses exist today without a web-site. Whilst the focus of this first phase of e-commerce was on end consumers, the second phase tackled the B2B relationship between corporate buyers and their suppliers. B2B e-commerce sites quickly evolved to provide more direct integration between buyer and supplier systems. Standards, such as XML quickly evolved to facilitate this. 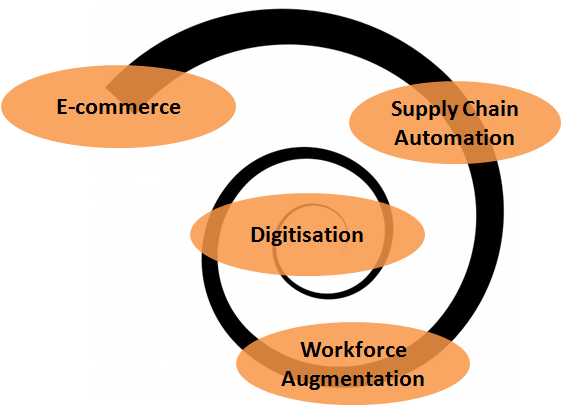 Supply chain automation can be used to make existing exchanges of information more efficient. It can also increase the flow of information. For example, RFID allows retailers, distributors and manufacturers to track stock levels and movement, automating stock management and better integrating with robotics. Not only did this improve efficiencies, with smaller orders and faster delivery cycles, but it also allowed previously monolithic organisations to disaggregate into networks of smaller interdependent and more specialised suppliers. McKinsey & Co estimates that whilst 49% of companies invest in E-commerce, only 2% of companies invest in digitalising their supply chain. Although we've had expert systems for many years, it is the development of digital customer and supplier interfaces which generate the data required to move them towards true artificial intelligence. For an explanation of this effect, see More data usually beats better algorithms. Information-based jobs will inevitably be hardest hit first. Think of insurance underwriters and claims managers, fund managers, accountants, etc. But inevitably most jobs with any element of repetition will be impacted. Taxi drivers are at risk from autonomous vehicles, for example, and there is already talk of robots performing some surgeries more accurately than skilled surgeons. There is already evidence that banks are hiring fewer people with finance backgrounds to do the work, and more people with technology skills to automate it. It strikes me as anachronistic that organisations are slow to adapt and to provide their employees with the same level of tools to use in their jobs as other companies provide them to use as their customers. Ultimately, this flows through into the customer experience when call centre operators are unable to provide quick and definitive solutions, leaving you with the impression they are still switching between multiple disconnected systems to get answers and process requests. The resulting end-to-end digitisation of the value chain opens up possibilities, not just for delivering existing products and services more effectively, but for creating entirely new products and services. Again, this started with information-based products: think, for example, of the development of subscription-based streaming media services, compared to purchased physical media or broadcast services. But it is now moving increasingly into physical products as well. This is enabled by the Internet of Things (IoT), a network of sometimes semi-autonomous things able to sense elements of the real world and communicate with each other and controlling systems. Already we have devices fitted in cars which can collect data about the performance of the car and can communicate this to service technicians and insurance companies. We also have activity trackers which measure things like sleep, activity levels and heart rate on a continuous basis, and upload the data to servers for analysis. Of course, it is still hard to imagine where this could go. Imagine that your calendar/organiser is able to determine where you are now, where you need to get to for your next meeting, and can arrange for an autonomous vehicle to take you there, all without you needing to do anything. Note only does digitisation replace or enhance physical products, and create completely new entirely digital products, it also often develops whole new ecosystems of digitally connected organisations, people and devices which collaborate together in previously unimaginable ways. When I look at offices and factories full of people hunched over keyboards, screens and other equipment, I always get the sense that somehow it is the people working to satisfy the requirements of the machines. I read today a prediction that in 10 years time, most interfaces will not have a screen. I believe that is because the machines will talk to us, as we now talk to each other, and talk to each other silently using some form of wireless protocol. In a fully digitised world with a fully developed IoT, you can imagine that finally, it will be the machines who serve the people, fading into the background as they do. Organisations who remain focused on e-commerce alone will eventually be outcompeted by those that embrace all four stages of digitisation. All organisations must now look at all four phases of digital in parallel in order to remain competitive. Organisations where a high proportion of the total labour cost is direct (that is directly proportionate to the volume of products and services provided to customers) rather than indirect (that is devoted to researching and developing new and improved propositions) will fall behind. Employees should be firmly focused on creating new sources of value, and not delivering existing sources of value.